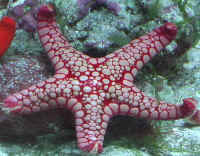 Related Articles: Fromia Stars, Asterina Stars, An Introduction to the Echinoderms: The Sea Stars, Sea Urchins, Sea Cucumbers and More... By James W. Fatherree, M.Sc. Any of those a likely culprit? I suspect the Lysmata wurdemanni.